Canadian CF-18 fighter jets carried out their first bombing mission in Iraq last Sunday, dropping 500-pound, laser-guided bombs on an Islamic State in Iraq and Syria (ISIS) position near Fallujah. According to Canadian government and military sources, the bombs targeted construction equipment that ISIS was using to divert water from the Euphrates River to assist its military operations. Official spokesmen refused to say if any ISIS fighters were killed in the bombing raid, but claimed that there had been no civilian casualties. Canada has deployed a fleet of nine Royal Canadian Air Force planes—six CF-18 fighters, two Aurora surveillance planes, and a refuel aircraft—and 600 military personnel—pilots and other flight crew, maintenance workers and support staff—to Kuwait to join the new US-led Middle East war. Dozens of Canadian Armed Forces’ (CAF) Special Forces have also been deployed to northern Iraq to advise and train Kurdish Peshmerga militia. These are lies. The war Washington has unleashed and that Canada has now joined is a continuation and an outgrowth of the US’s illegal 2003 invasion of Iraq, the NATO “regime-change” war in Libya, and the insurgency the US and its allies, including Turkey, Saudi Arabia, and other Sunni Gulf absolutist regimes, have fomented in Syria. In both Libya and Syria, the US used Islamacist forces, including many now to be found in the ranks of ISIS, as its proxies in seeking to install governments more subservient to Western imperialist interests. The war’s overarching goal is to shore up and expand US hegemony over the Middle East, the world’s most important oil-exporting region. While ISIS is the first target, and the casus belli, the war’s ultimate aim, as is openly proclaimed by Saudi Arabia and many other of the US’s regional allies, is to overthrow Syrian President Bashar Al-Assad, a close ally of Iran and Russia. With the support of the entire political elite, including the trade union-supported NDP, Canada played a leading role in the 2011 regime change war in Libya. And it is now assuming a similar frontline combat role in Iraq. The head of CAF’s military operations, Lieutenant-General Jonathan Vance, said yesterday that since CAF planes entered the war-theater late last week, they have flown 27 missions, with 18 of them involving CF-18 fighter jets. Vance also boasted that Canada is “actively involved in the command-and-control structure” of the coalition bombing-campaign including the choosing of bombing targets. It is noteworthy that the location of Canada’s first attack was Fallujah, scene of some of the most horrific war crimes committed by US forces during the Iraq War. In 2004, Fallujah was razed to the ground in an assault in which banned munitions including white phosphorous were used. In addition to massive violence and brutality, the US employed “divide and rule” tactics in pacifying Iraq under a pro-US government. This deliberate fomenting of religious and ethnic divisions helped create the conditions in which ISIS could emerge and win a measure of support from sections of Iraq’s Sunni minority. 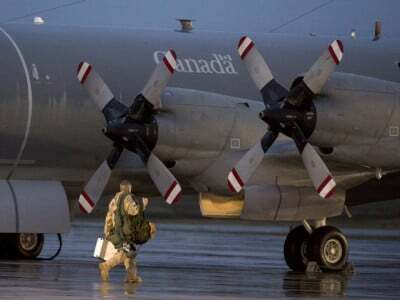 Even as the CAF initiates combat operations in Iraq, there are ever more clear signals from US and Canadian military and government officials that much more than a bombing campaign will be required even to fulfill the war’s current, publicly proclaimed objective. Following a meeting of coalition military leaders in Washington last month, the head of Canada’s military, Tom Lawson, said it would take considerably longer than six months—the current authorized length of the CAF combat mission to the Mideast—to rebuild and train the Iraqi army. In an interview with the CTV’s Question Period on Sunday, US Pentagon Press Secretary Rear Admiral John Kirby said that the US is preparing for a “years’-long effort” against ISIS, adding that Washington is looking forward to cooperation with Canada in this. The government motion supporting the CAF deployment says that Canada could participate in bombing raids in Syria, but only if approved by the Syrian government. The opposition parties have roundly denounced this as legitimizing the Assad regime and a “betrayal” of the imperialist-backed insurgents, whom they enthusiastically support. However, it may well be that the Harper government is in fact paving the way for a Canadian intervention in Syria if and when the US and its allies organize and extend diplomatic recognition to an “opposition” government, as they did in Libya with the National Transitional Council. In an interview with the Canadian Press, a senior commander of the Free Syrian Army praised the Harper government for its opposition to Assad, but urged Ottawa to focus its efforts on providing military training to the rebels in Syria. Brigadier-General Hussam Alawak described the reliance on air strikes as “useless,” and advised Canada to draw on its experience in Afghanistan, where Canadian troops played a leading role in the neo-colonial counter-insurgency war against the Taliban, to train anti-Assad fighters. While a Defence Department spokesman quickly moved to distance the government from Blondin’s remarks, describing them as inappropriate, the truth is that Prime Minister Stephen Harper and his government sought from the outset to exploit the killings to boost support for the government’s militarist policy abroad and attacks on democratic rights at home. Harper has repeatedly referred to the attacks as “terrorist attacks” and suggested Canada is under terrorist assault even though the two killings were carried out by lone individuals with no links to a “homegrown” terrorist organization, let alone one based in the Middle East. Aware of the widespread unease and outright opposition to Canada’s participation in yet another US-led imperialist war among working people, both the NDP and Liberals voted against the government’s war motion in a parliamentary vote last month. Their differences with the government, however, are purely tactical and principally motivated by electoral calculations and fears of the growth of an antiwar movement outside of establishment channels. Almost up until the last minute the Liberals had indicated they would support the deployment of Canadian fighter jets, and no sooner was the vote over than Liberal Defence critic Marc Garneau declared that now the issue was settled, the Liberals stood with the CAF. The NDP, for its part, says it favors using Canadian army planes to funnel weapons to the US-backed Iraqi government and the Kurdish Peshmerga and has voiced its emphatic support for the US drive for regime change in Syria. Party leader Thomas Mulcair, who spent much of July and August defending Israeli war crimes in Gaza, angrily denounced Harper for lending legitimacy to that “genocidal maniac” Assad, because the government motion said Canadian military intervention in Syria would require the consent of its government.